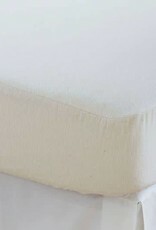 Crib Mattress Protector, Organic Cotton - Springfield Mercantile Co.
100% organic cotton, 13 oz flannel lays the perfect foundation for your baby's organic bed. The protector is natural in color because it is un-dyed, perfect for even our most sensitive customers, designed to be the most natural cover with minimal processing and treatment. 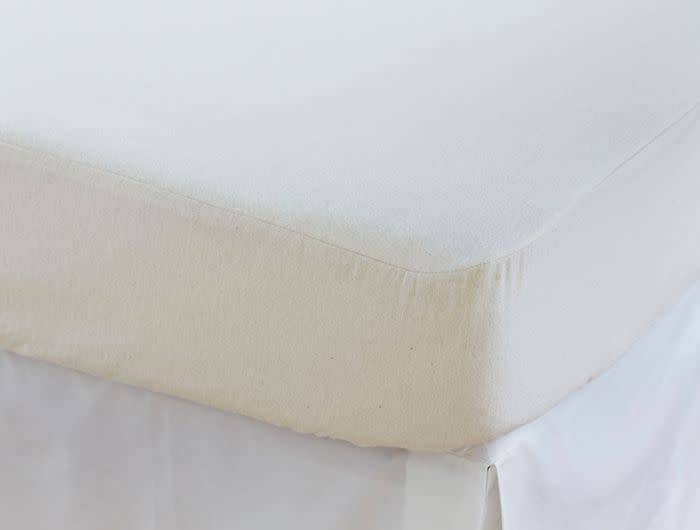 It is thick, absorbent flannel, so it offers protection to your mattress without a lot of extra layers and batting. A unique construction of flannel on top and sides with elastic on all sides for a secure fit on the mattress. Cotton is 100% organic, and sourced in Germany. All of Coyuchi's organic cotton products are machine washable. We recommend machine washing on the gentle or delicate cycle with like colors, with cold water and a natural, plant based laundry detergent. We do not recommend using whiteners, as bleaching agents may diminish the brilliance and depth of the colors; when needed, use only non-chlorine bleach. Line dry, or tumble dry low and remove promptly. Fabric softeners and dryer sheets reduce the absorbency of cotton textiles and are not recommended. Place a set of our wool dryer balls inside the dryer to naturally soften the fabric and reduce drying time. Use a warm iron as needed.